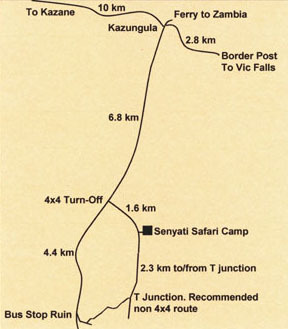 If you drive a 4×4 then feel free to use the 1.6 km sandy road to Senyati, marked as “4X4 Turn-Off” on the Area Map. If your car is NOT a 4X4, we recommend that you take the following road. DO NOT attempt the 4×4 road, you will get stuck! 84km after Pandamatenga you will see the Lesoma turnoff sign. Turn right at the old bus stop ruin (on your left) onto a dirt road. Turn left at the first road on your left (+-550 metres) after you turned right at the bus stop ruin. Drive until you see a huge water tank on your right. Sway to the right at the water tank. Follow the curvy road. Continue by swaying left all the time following the same curvy road. At a Y fork, go to the right. Drive until you see a house with three arches in the front (this is a kind of T-junction). Go left. Drive 2.3 Km and you will see the Senyati Reception Sign on your right. 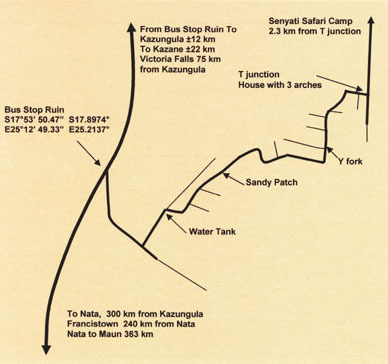 +- 12km from Kazungula you will see the Lesoma turnoff sign. Turn left, it is right accross the bus stop ruin. Turn left at the first road on your left (+-550 metres after you turned left at the bus stop). Drive until you see a huge water tank on your right. At a Y fork, go to the right. Drive until you see a house with three arches in the front (this is a kind of T-junction) Go left. Drive 2.3 km and you will see the Senyati Reception Sign on your right.